Raised gardens make in possible to grow flowers and vegetables in nearly any area that has sufficient light. Many gardeners prefer to construct raised beds from wooden timbers or other building materials like cement blocks or natural stone. However, raised beds do not require a constructed frame to be effective. Simple mounds of soil raised above the ground level provide ample room for roots to grow and create an attractive bed. Select the building material you prefer. Recycled timbers, natural stones found on your property and old logs make effective borders for raised bed, but you may prefer to purchase new materials to build a bed. For simple mounds of soil, you may wish to border them with small stones or other decorative material. Layout the dimensions of the bed with string or a chalk line. Limit the width of the bed to four feet to allow you to reach the center from both sides. Typical beds range in length from four to eight feet. Longer beds are an option, if you do not mind walking around the bed to reach the opposite side. Construct the perimeter of the bed from your chosen materials. Keep in mind that heavy planks, beams or logs can be laid in place and do not require nailing. Boards typically require nailing. 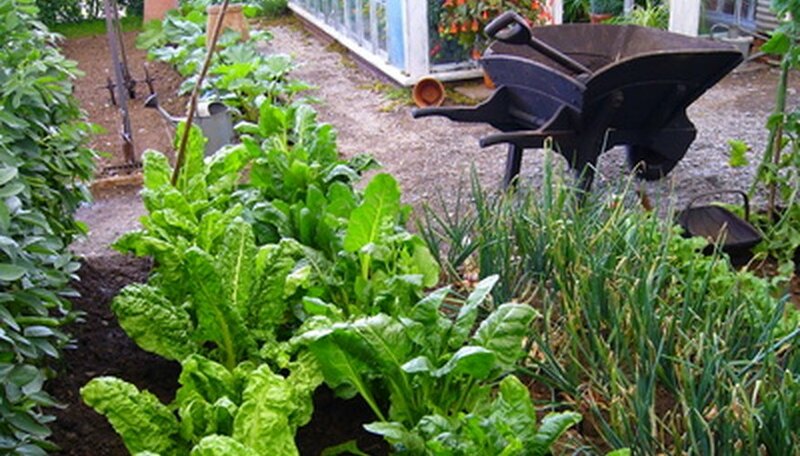 For growing vegetables and large flowers, the depth of the bed should be eight inches or more. Calculate the amount of soil for the bed by determining the volume in cubic feet. Measure the bed in feet and note inches as a fraction of a foot in decimal notation. For rectangular or square beds, multiply the width by the height by the depth to determine the volume in cubic feet. Divide the results by 27 (the number of cubic feet in a cubic yard) to determine the number of cubic yards of soil required to fill the bed. Soil is sold by the cubic yard. Calculate the volume of a round bed by determining the area of the bed in square feet . To calculate the area of the circle multiply Pi (3.14) by the radius (1/2 the diameter of the circle) squared. Multiply the result by the depth to get the cubic feet. Divide by 27 to determine the cubic yards of soil required to fill the bed. Fill the raised bed to the top with soil, water to moisten the soil and allow to set for 24 hours. Refill to the desired level once soil has settled. Follow the planting instructions included with seeds or seedlings for seed depth and planting time. Space vegetables or flowers to the recommended plant spacing in all directions. It is not necessary to allow for distance between rows. For example, plant beans four inches apart in all directions. This allows you to grow more produce in less space. Calculate the volume of irregular shaped beds by breaking the area down into rectangles. Determine the volume of each and add them together to find the total volume.